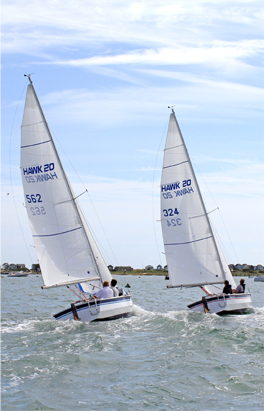 Hawk 20 is the result of a two year design and development programme to fill a need for a really modern, well balanced, unsinkable 20ft sea-going day-boat which is fast on all points of sailing, could go as close to the wind as an efficient racing dinghy and be able to tack like one. It had to be easy to sail single handed and so stable that it would carry all its sail up to Force 6 without reefing and would not capsize in normal circumstances – At the same time we wanted a shallow draft and lifting keel for exploring creeks and so that launching and recovery could be done in minutes with the minimum of muscular effort and without getting the trailer axle, hubs or brakes in the water. We decided to design and build Hawk 20 to a high quality, regardless of cost, to avoid the gear failures we had so often experienced on other boats in over 35 years of sailing. There has been a lot of input and experience from the Reid family. Rollo Reid, Technical Director has sailed most of his life and helmed the Royal Engineers’ Contessa in the 1974 Round Britain Race and other similar long distance events. Peter and Tim Reid, both involved in technical matters within the company, have sailed from the age of 6 and currently compete successfully with Lasers and Hurricane and Tornado catamarans (Tim came 3rd in the Olympic Trials for the Tornado) and Mike Reid, the MD, who has cruised and raced for nearly 30 years. Combining their wealth of sailing experience, they have all been involved in developing and testing Hawk 20 with the designer. We decided to design and build the Hawk 20 to a high quality, regardless of cost!